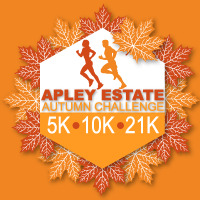 The 6th running of the Apley Estate multi-terrain event presented by Wrekin Road Runners will be on the 29th September 2019. We will again be raising funds for Stockton Church and St. Milburga Church in Beckbury. Due to the nature of the location and accessibility the distances may vary slightly from 5k, 10k and 21k; we will adjust the course chip timing to ensure it reflects the distances and provides you with accurate pacing splits. Race start: 21k - 10:30 10k - 10:40 5k - 10:50. Note the 5K event is open to those 12 Years and older, 10K and 21K are 17 Years +. More details on the event website. Age bracket calculated using 29/09/2019.